In this post Roberta Payne writes about the relationship between schizophrenia and art. Roberta earned a BA in classics from Stanford, an MA in Italian from UCLA, an MA in romance languages from Harvard, and a PhD in comparative literature from the University of Denver. She taught English, Latin, and Italian, and her published work includes literary translations from Italian, short stories, and articles on schizophrenia. In 2013 Roberta published a memoir, Speaking to My Madness: How I Searched for Myself in Schizophrenia. 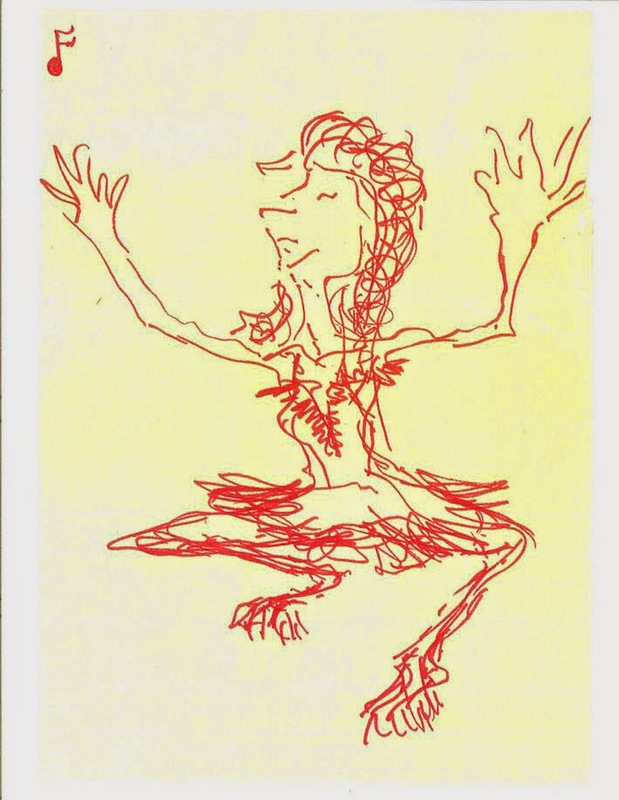 Her article "My Outsider Art" has recently been published in the Schizophrenia Bulletin, and is available open access. Although I’ve done art since I was a small child and studied art history formally in college, I didn’t find my artistic niche until I developed mental illness in my early 20s. Then I began a long love affair with what has been dubbed “outsider art,” the art of people variously marginalized in society, to distinguish it from the consensus-reality art of the nonmarginalized. In my case, the term meant the sometimes strange, often beautiful art of schizophrenia. My materials of choice have been pen and ink and paper, and my favorite stylistic form is the round mandala originally of ancient India. I’m a whirling dervish in my ultimate art fantasy. In this fantasy, I put myself in a large, cube-shaped room covered on all 6 sides with whiteboards. A bright light bulb hangs down to the middle point of the room. I have a ladder and lots of black dry-erase pens. Whirling, I effortlessly draw as fast as I can, one image creating and then turning into the next, on and on, over the ceiling, the walls, and the floor, moving right along until the whole room is covered with my doodles; and then I elaborate the doodles, around and around; and finally the entire whiteness is filled up with black. I have become pure energy, just what I suppose whirling dervishes aim to become. Are these examples of loosened ego boundaries or, instead, just part of the nature of creativity? On the one hand, it seems to me that, if the artist works from within consensus ego boundaries, she takes the material’s dimensions into account from the moment she begins to compose. On the other hand, when an artist is psychotic and having difficulties with her own boundaries, does she come to a grinding halt at the boundaries of the material? I have found myself stopped cold by the ruthless edge of the paper, and often wandering beyond the circle or perimeter of a mandala I am quickly, impulsively drawing. Just as my outsider ink or paint often spirals outward, so at the same time it often spirals inward, like a fractal. Another metaphor of this dual movement has an eggbeater mixing items together in a bowl that is too small, so that much of the resultant mixture is hurled outward, while much is folded into itself again and again. In real life, during the times when I was most ill, I obeyed alien creatures as large as galaxies; and at the very same time I turned inward, examining my thoughts from every angle and relentlessly dissecting them. I could have been a watch repairman or a lace tatter. Little wonder, then, that I loved drawing a carnation, articulating every jagged petal; or an armadillo; every bump on every leg of an octopus; a head of cauliflower. I discovered that I could make a vine that produced leaves, the ends of which cried tears, each of which in turn contained a human face. One tear might fall on a spider (that wore 8 boxing gloves), imploding it and thus causing its web to sag so that a butterfly might escape it and fly to… I typically spent 6–8 h in one sitting so that the tension of my pen would remain uniform. Some schizophrenic art, however, is more conventionally structured; it might be limited to 1 or 2 images with no extreme outward or inward movement, no apparent sense of being hemmed in, no building of fractals. But it often has “different,” idiosyncratic rules and aesthetics. For instance, I once drew on poster-size paper a gracefully diagonal, writhing black eel. So far, conventional structure that any artist might have planned. But the eel’s mouth was a circle of jagged teeth, out of which poured, in lovely calligraphy, words, phrases, and sentences about the nature of evil. (This was in response to the Aurora theater shootings.) I can’t imagine that this drawing would be anything but abnormally chilling to a consensus-reality viewer, chilling like the hallucinations of huge, neon, electric spiders slithering down walls struck me decades ago, when I experienced delirium tremens from alcohol withdrawal. The (usually anonymous) schizophrenic art I have viewed in books and on the Internet often has unique, otherworldly traits, especially aesthetics that remind the viewer of isolation, of a world made of metal, and bone-rattling electricity. It could be that the avoidance of aesthetic revulsion (a kind of fear) is a tactic that consensus reality uses to maintain its balance. The most extreme example of creating repulsiveness takes place for me when I’ve been drawing while paranoid. I’m appalled by what I’ve drawn, just as I’m appalled by the paranoia itself, which feels like fear and anger experienced simultaneously. The figures I draw are nasty, sneering, in a world I want to run from: weird bats, black crows with huge wingspans, eerie owls uttering phrases in Latin. I’ve often hid those drawings, afraid of their power over me, and afraid of the startled reactions of others. After examining on the Internet over a 100 paintings and drawings by artists with schizophrenia, I am struck by the thought that not only who you are and how you behave come from what is going on in your brain; but also that what you produce, the artifact itself, mirrors those features. For example, we can sometimes see fragile ego boundaries, extreme introspection, and sensory overload or crowding visible in a piece of art—a sort of reenactment of workings of the mind. What can be explained less easily—and are in the end the hallmarks of schizophrenic art—are the otherworldly taste, the love of the bizarre, the sense of a different journey. They are present sometimes to an overwhelming degree, like eerie, sky-high constructions of yellow-and-purple pinecones; sometimes as subtly as a wisp of oddly curling smoke. Here you can visit Roberta Payne's website.